Working in partnership with the school, the PTA helps to develop strong links between home and school. The PTA provides an opportunity for everyone to work together towards a common goal and is open to all parents and teachers. It brings everyone together to support the school, raise money and make a difference for the children. Our PTA is very active and organises both social and fund-raising activities. All parents automatically become members of the association and are warmly invited to all events, even if they only have a small amount of time available to get involved. Your support is greatly appreciated. Exciting plans afoot for our school playground! Pirate ships, rockets, teepees, water play and more…but we need your help! We are collaborating with the PTA to build a magical playground brimming with opportunities for imaginative and creative play. Join us at our annual fundraiser? 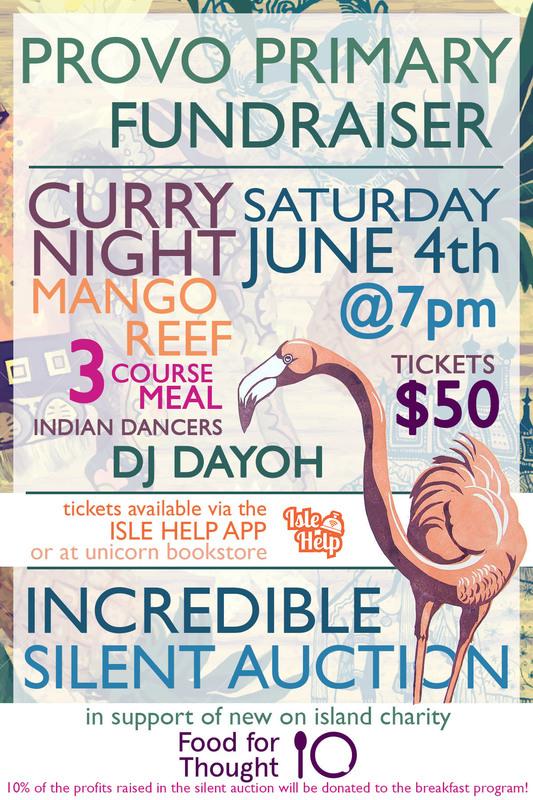 Don’t miss out on the fun this Saturday at Mango Reef. Tickets $50 for a three course dinner! 7pm til late. Pop into Provo Primary or call 441-5638 to reserve your tickets. We look forward to seeing you there and enjoying our DJ, dancers, curry buffet, silent auction, children’s art auction and more!